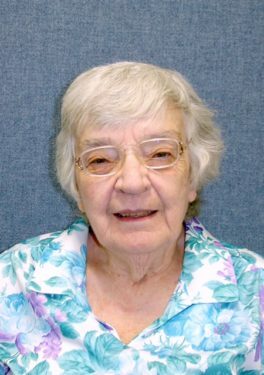 Sister Regis Milhaven, O.P., a Sister of St. Dominic, Amityville, for 67 years died March 17. She was 87. Born as Rose Regis, she attended St. Agnes A.H.S., College Point, where she met the Dominican Sisters. She entered the novitiate at Queen of the Rosary Motherhouse Sept. 6, 1948. She received the habit and her religious name, Sister John Regis on Aug. 4, 1949. She professed final vows the following year. The first 30 years of her ministry were devoted to education. Locally she taught physics, chemistry and was department chair at St. Agnes A.H.S..
She received her bachelor’s and master’s degrees from St. John’s University and a doctorate from Fordham University. In 1969 she began teaching at Molloy College, Rockville Centre, where she earned the rank of professor. She also taught at Medgar Evers College in Brooklyn. Drawn to ministry among immigrant populations, Sister Regis embraced pastoral ministry and religious education at St. Ignatius, Crown Heights, St. Peter Claver, Bedford-Stuyvesant and St. Barbara, Bushwick. In the early 1980s, she became an advocate at St. Mary’s Hospital, Brooklyn, and then director of religious education at Our Lady of Sorrows, Corona. At St. Mary Star of the Sea, Carroll Gardens, she once again ministered in pastoral services. Returning to religious education, from 1990 to 1995, Sister Regis was director of religious education at St. Paul the Apostle, Corona. In 1995, she moved to the motherhouse in Amityville, where she first served as a researcher and then as a driver. She took sisters to doctor appointments and to visits with family. A Mass of Christian Burial was celebrated in St. Albert’s Chapel at Queen of the Rosary Motherhouse, March 20. Burial followed in the Sisters’ cemetery.